HUROM is a revolutionary line of juice extractors that use the Slow Squeezing Technology (SST) gently squeezes ingredients, preserving natural taste & nutrients lost by high-speed juicers that grind and crush. SST also retains heat-sensitive nutrients such as Vitamins A and C, and live enzymes. 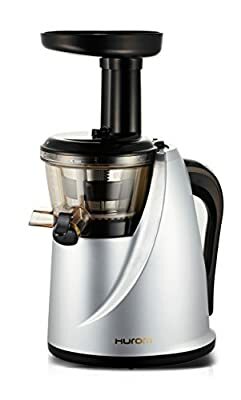 The HUROM Slow Juicer works like a mortar and pestle, "cold-pressing" and squeezing food to minimize damage to ingredients. Using Hurom's cold-pressing system, 35% more juice is extracted from your foods than with traditional high-speed juicers, leaving less and drier pulp. 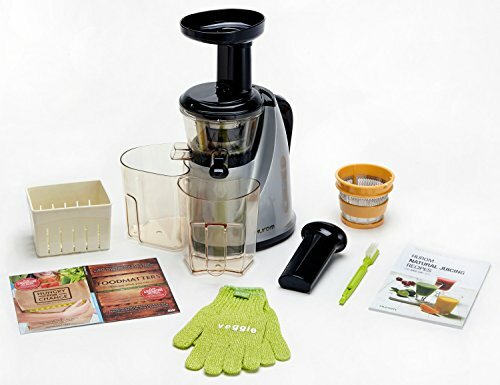 The Hurom masticating juicer can easily process fruits, vegetables, leafy greens, wheatgrass, nuts, and soy to make a variety of juices, milks, sauces, marinades, even baby food. Hurom's durable motor has a 5-year warranty, uses only 150 watts of energy and an ultra-quiet 80-RPM AC induction motor. SET INCLUDES: Top Selling Hurom HU-100 Masticating Slow Juicer in Silver. Nesting juice and pulp containers. Cleaning brush. Recipe booklet. EXTRA coarse strainer for soft foods and smoothies. BONUS veggie scrubbing gloves. BONUS tofu press. BONUS DVD combo 2-pack - "Food Matters" and "Hungry for Change", as well as Food Matters TV free 1-month subscription (online). BENEFITS OF HUROM: Slow Squeezing Technology minimizes damage to ingredients. Juice fruits, vegetables, leafy greens, soymilk, nut milks, and even wheatgrass.. Continuous juicing and easy cleaning. Quiet operation with an energy saving 150W AC induction motor. FEATURES: 150 Watt, 80 RPM AC induction motor. Juice cap for drip-free operation and ability to make mixed drinks. Patented dual-stage process with continuous juice extraction. Quiet operation. Nesting juice and pulp containers. Standard clear bowl with locking tabs. Classic loop handle in black. Classic design in silver. BpA-free Ultem strainer and auger. Standard cleaning brush. Standard self-cleaning feature. Recipe brochure. Loop carrying handle. JUICER: Top Selling Hurom HU-100 Masticating Slow Juicer in Silver with Juice Cap for Drip-Free Pouring and Mixed Beverages. Patented SLOW Squeezing System that works like a mortar and pestle. Can easily process fruits, vegetables, leafy greens, wheat grass, nuts, and soy to make a variety of juices, milks, sauces, marinades, even baby food. SET INCLUDES. Hurom HU-100 Juicer, Nesting juice and pulp containers, Cleaning brush, Recipe booklet. 5 Yr. Motor Warranty, 1 Yr. Parts. BONUS GIFTS: EXTRA Coarse Strainer, BONUS Veggie Scrubbing Gloves, BONUS Tofu Press, BONUS DVD 2-pack & Food Matters TV subscription.